Whether you work in an agile team, or write traditional specifications, the essential business analysis task is to uncover the real needs of the real customers. Without understanding the real need, it is extremely difficult to deliver real value. We take you through a framework for discovering the customers and their needs, for finding solutions and evaluating them, designing the business solution and getting it built. 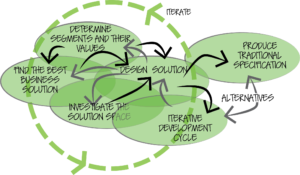 We look at how business analysis integrates with either agile or traditional development. Do You Know What Your Customers Value? The solution space includes the people, software and devices used to fulfil the needs of the customer segments. You investigate this space by looking at the necessary business processes and data. The solution involves, and is used by, humans; your investigation studies the culture and characteristics of the people involved in the solution. The investigation is quick, but thorough enough to prevent any nasty surprises for the development team. Product or Program Manager or similar titles. We also find Business Stakeholders, Users, Software Customers and Testers benefit from learning advanced business analysis techniques, and how they can contribute to the organisation’s wellbeing.